Vital Link has a diverse background working with data & drawings, editing & writing Technical Orders, and providing training programs. VLI has the experience to deliver drawings, manuals and other technical data. Under our IDIQ, we have submitted numerous T.O. and manual revisions as well as Engineering Change Proposals, along with numerous design and production drawings and manuals for aero engine test facilities, complex steel structures and ground support equipment. Vital Link has the capabilities to edit and write Technical Orders in an SGML format. Documents will be completed in output file types DWG, TIF, and PDF using AutoCAD, SolidWorks, or Adobe Illustrator. Vital Link’s Technical Writers have years of experience delivering manuals and technical orders to our customers. Our knowledgeable engineering and project management staff are available to perform on site validation of manuals and technical orders, through step by step visual inspection and operation of all equipment systems and subsystems. Vital Link’s, Vital Link Europe’s, Celtech’s, NETS’ and Atec’s 200 years of operating workforce allows us to assemble a hand-selected training team for projects. We use design engineers, program managers, and QA Inspectors who understand and have direct experience with each project. It is our extensive background that gives us the experience and understanding to help with training programs. 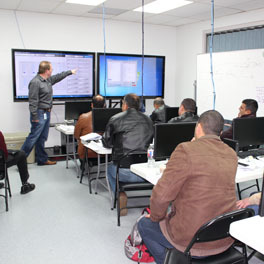 Vital Link provides comprehensive training for personnel in the operation, maintenance, and calibration of the test cells. Our company will send our test cell experts to train your personnel. Vital Link can perform Maintenance Training to demonstrate the proper procedures to be followed to maintain the test cells, including a review, spares lists and costumed suggestions to suit each customer’s unique requirements.